Lille (France) Sep 15 (IANS) Defending champion France is one win away from back-to-back Davis Cup final berths after Lucas Pouille defeated Spain s Roberto Bautista-Agut 3-6 7-6 (7-5) 6-4 2-6 6-4 to give his side a 2-0 lead. Earlier on Friday Benoit Paire got France off to a strong start by routing an injured Pablo CarreÃ±o Busta 7-5 6-1 6-0 at Stade Pierre Mauroy an indoor hard-court venue in this northern city reports Efe. Bautista-Agut did his utmost to get Spain on the scoreboard winning the first set of his match against Pouille and then staving off seven set points in the second set before finally losing a close tiebreaker. The third set proved to be a key missed opportunity for the Spaniard who lost six of seven games after jumping out to a 3-0 lead and was unable to convert a break point in the 10th game that would have evened the set at 5-5. Bautista-Agut responded well however to win the fourth set earning breaks of serve in the fourth and eighth games to force a decider. 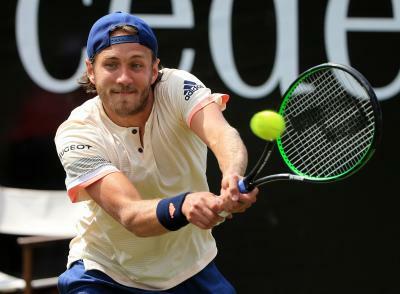 In the fifth set Pouille snagged the all-important service break in the ninth game and then finished off the victory in three hours and 41 minutes with a difficult service hold. The Spaniard staved off two match points and created a break point in that last game but the Frenchman reeled off the last three points to win the match in three hours and 41 minutes. French captain Yannick Noah credited his player s aggressive play for the victory in the second rubber. "I thought Luca deserved it but it was so close. At this level in a semi-final it s all about who goes for it. You can t wait for the mistake " Noah said. Pouille led France to their 10th Davis Cup title last year when he won the fifth and deciding rubber in a 3-2 win in the final over Belgium. The Frenchmen can book a spot in this year s final by winning Saturday s doubles which will pit Julien Benneteau and Nicolas Mahut against Spain s Marcel Granollers and Feliciano Lopez. If the Spaniards win on Saturday the tie will come down to Sunday s reverse singles. Croatia leads the US 2-0 after Friday s opening singles matches.